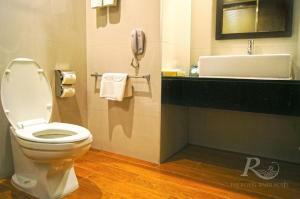 The air-conditioned rooms feature classic interiors and a private balcony overlooking the Chao Phraya. It comes with a cable TV, fridge and seating area. Situated next to Krung Thon Bridge, Hotel Royal River is about a 20-minute drive from the Grand Palace, Emerald Buddha Temple and Parliament House. 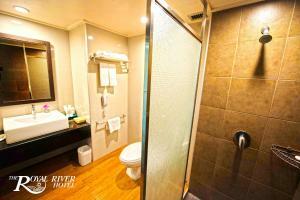 It is approximately a 45-minute drive from Suvarnabhumi International Airport. For leisure, guests can have a relaxing Thai massage or use the sauna and steam rooms available. It provides tour and shuttle boat services as well as free parking. Dining highlights include casual international dining at Fangnam Coffee House and hearty barbecues at Rim Nam Terrace. The hotel also has 2 bar lounges and 24-hour room service. Features spacious interiors and a private balcony with views of Chao Phraya River. Rate: THB 2916.00 ... THB 2925.00; select dates below to get current rates. Air-conditioned room features floor-to-ceiling windows overlooking the city. Rate: THB 2275.00 ... THB 2925.00; select dates below to get current rates.